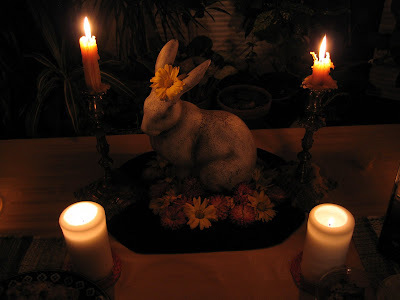 According to Bede the name of the Christian festival of Easter was adopted from an Anglo-Saxon goddess called Eostre, spelt by other writers Eastre, Ostara, or Eastur. The name is cognate with Aurora, Eros and with Ushas, the Sanskrit for dawn. The month of April was called Eostur-monath, the Dawn month, and the pre-Christian festival of Easter included rites symbolic of death and resurrection. Few details are known, but there is no reason to think that it differed basically from other spring festivals such as that of Adonis . . . which were held in Western Asia and in Greek lands. 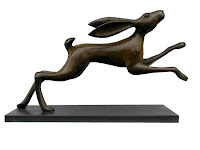 Eastre's favourite animal and attendant spirit was the hare. 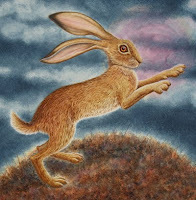 Little else is known about her, but it has been suggested that her lights, as goddess of the dawn, were carried by hares. . . . The hare was a companion of Aphrodite too, and of satyrs and cupids. Wedding rings in ancient Greece bore its image and in the Middle Ages it appears beside the figure of Luxuria [self-indulgent sexual desire, personified as one of the deadly sins]. Elsewhere it represented love, fertility and growth. It is associated with the moon, dawn and Easter not only in this respect – as a symbol of physical growth – but in their deeper, spiritual meanings: the enlightenment of the soul through death, redemption and resurrection. Like the Easter egg itself the hare is an emblem of body and soul.